When it comes to plumbing problems, locals know to call the best plumber Santa Monica has to offer. Hammer Plumbing & Drain has become a staple of the neighborhood due to our first-rate, recognizable handiwork in the community. Whether you live in the areas surrounding SMCC or occupy a condo near Third Street Promenade, our team of experts has been servicing people’s leaky pipes, clogged toilets and busted sewer lines for years. West Los Angeles is our home, and we view our clients as our neighbors rather than just another business opportunity. Customers appreciate our expertise and community-minded approach. In fact, we’ve been called the best plumbing company Santa Monica has to offer on more than one occasion, and we believe the distinction is earned. We offer a wide variety of services and can repair just about any plumbing problem common to homeowners, apartment dwellers, and even commercial property managers. Our team of experts is trained in general plumbing services. When you’re faced with a stopped-up drain or faulty sink, we can help. But our knowledge extends beyond the basic as well. For example, when water mains break, they can be a huge headache, causing flooding and potentially untold damage to your property or home; we can fix that. The scope of the job doesn’t intimidate us. Whether it’s a simple pipe fix or sewer line repair, we can help day or night. There’s never a good time for an emergency. Whether you’re at work, at home with your family, or asleep, sudden, serious plumbing issues can strike at any hour. If you’ve owned or rented long enough, you’ve most likely experienced a flooded room, wall or ceiling. Dirty water pools on the ground or worse – rains down from above. Unfortunately, you can’t simply wait to handle this tomorrow. This kind of situation requires the services of the best emergency plumber Santa Monica has to offer – right now. Hammer Plumbing & Drain is equipped to handle your last-minute disaster, whatever it may be. We understand that your needs can’t always conform to business hours. The reality is that plumbing and water systems operate on their own schedule, and may break down at the least convenient time. 3am is never a good time for a pipe refitting or line break, yet you might be faced with this unfortunate circumstance. You need a professional who’s available 24/7 to pick up the phone. Any plumber in Santa Monica may offer to help you from 9 to 5, but only Hammer can deliver their unique brand of expertise round the clock. Among the many facets of home and commercial plumbing, pipes are perhaps the most crucial. They represent the skeleton of your property’s water system. You might not consider them on a daily basis, but you certainly notice them when the water stops working. 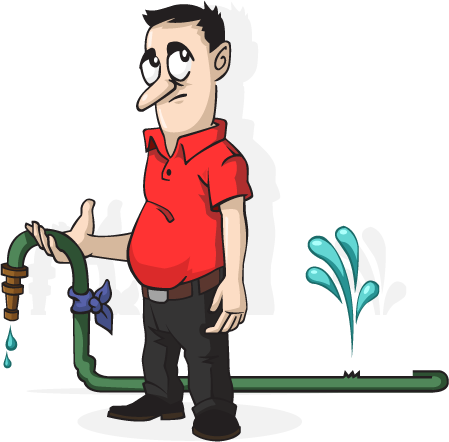 To repair a failed pipe or ensure that your lines are healthy, call the best plumber Santa Monica has to offer. Hammer Plumbing & Drain not only fixes broken pipes, but we install new ones as well. Your pipes may seem fine, but the truth is that older homes in our community are very susceptible to potential problems. Most likely, your aged residence near Main Street or along Wilshire Boulevard was equipped with copper pipes. These are durable in the short run but ultimately have a limited window. Copper is known to fail over time, causing floods on your property. Additionally, some say it can affect your home’s potable water. However, whatever your pipe preference is, we can install it. From copper to PEX to PVC pipe, Hammer can help choose the right fittings for you and seamlessly work them into your existing infrastructure, or completely replace the old with the new. Although most residents prefer not to think about them, sewer lines are critical to keeping your water supply sanitary. However, when they become clogged, they can cause serious problems for your home or commercial building. You don’t need to be an expert Santa Monica plumber to understand the warning signs of a clog: smelly, off-color water flooding your yard; backed-up fixtures; drains that don’t work. Unfortunately, this happens more than you think, and fixing it definitely isn’t a job for the average homeowner with a DIY spirit. Hammer Plumbing & Drain can repair your clogged or broken sewer line using minimally invasive techniques. While the job may sound like an enormous undertaking (and to be honest, it requires more work than simply fixing a broken toilet or faulty sprinklers), we can use advanced techniques to identify the source of the problem, and efficiently root it out. With minimal digging, we can have your sewer line working again as soon as possible. Santa Monica homes are renown for their class and style. Whether you live near the swanky shopping district along Montana Avenue, or occupy coveted real estate near The Pacific Ocean, residences here feature beautiful interiors, well-crafted infrastructure, and of course, some of the finest plumbing Santa Monica has to offer. Whether you’re remodeling, dealing with common drain issues, or even building from scratch, Hammer Plumbing & Drain can help you realize your domestic dreams. Kitchens and bathrooms put the greatest amount of stress on our homes’ plumbing. Running the dishwasher requires a heavy flow of water, and sink usage implies high demand as well. Meanwhile, showers and bathtubs strain the water supply on a regular basis, especially for a family that may need to bathe within the same time frame every morning (not to mention the strain put on the hot water heater). Residential Santa Monica plumbing systems are built to last, but after a while they can grow weary, and result in clogs, pipe failures, and more. Fortunately, our team of trained technicians is here to serve you. We can help restore the kitchens and bathrooms of your older home, or help create new ones after a move-in. We know that hiring someone to work in your home can be a stressful experience. Unfortunately, dubious contractors may have soured your view of plumbers in the past, or perhaps you’re generally skeptical of paying for handyman services. Whatever your point of view is, we go out of our way to ensure honest, stress-free work. Hammer Plumbing and Drain didn’t earn its reputation as the best plumbing company Santa Monica has to offer without a track record of solid, consistent work. Our customers have come to rely on us over the years. We’re the go-to business not just for typical problems with clogs, water heaters and mains, but for our transparent business practices as well. Our team of experts is competent, honest and reliable. Untrustworthy plumbers may give you a verbal estimate without ever investigating the job site first. Likewise, they may hit you with hidden charges based on inflated prices for parts and labor. Our technicians will be clear and up front with you from the start. We’ll do a thorough investigation of your leaky pipe or clogged sewer line, and create an honest and reasonable estimate to accurately reflect the anticipated work. For the best plumber Santa Monica has to offer, call Hammer Plumbing and Drain. After you’ve accepted our bid for the job, we’ll keep you advised throughout the process and are happy to answer any of your questions. We care about our work as much as we care about our customer service. Contact us now to fix your plumbing problems. Hammer Plumbing fixed our garbage disposal. It seemed to be clogged, but we couldn’t figure out what the problem was. After some digging, the plumber found a bunch of coffee grounds that had built up over time. He cleaned out the disposal and got it working again.